I forget how much I can get done on days when I really apply myself to working! I got quite a lot of work done today and mostly managed to avoid goofing off with my computer. Today I dropped Jeff off at the airport at 6AM for his 7AM flight. Since I was already up, I headed out to Home Depot to buy basement paint. Then I went off to Toyota to get the Highlander's oil changed. I was actually back to the house by 8:30AM. The contractors started work on demo of the pest damage this morning and since it was so loud downstairs where I usually hang out, I figured it was a good time to find some sort of activity upstairs. 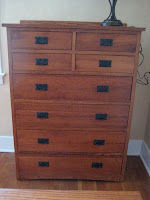 I washed down the new-to-us furniture with murphy's wood soap as well as mopped the hardwood floors upstairs. Then I went through and touched up any nicks and scratches with the stain pen I picked up at the Bentwood Furniture Outlet. The results were wonderful! 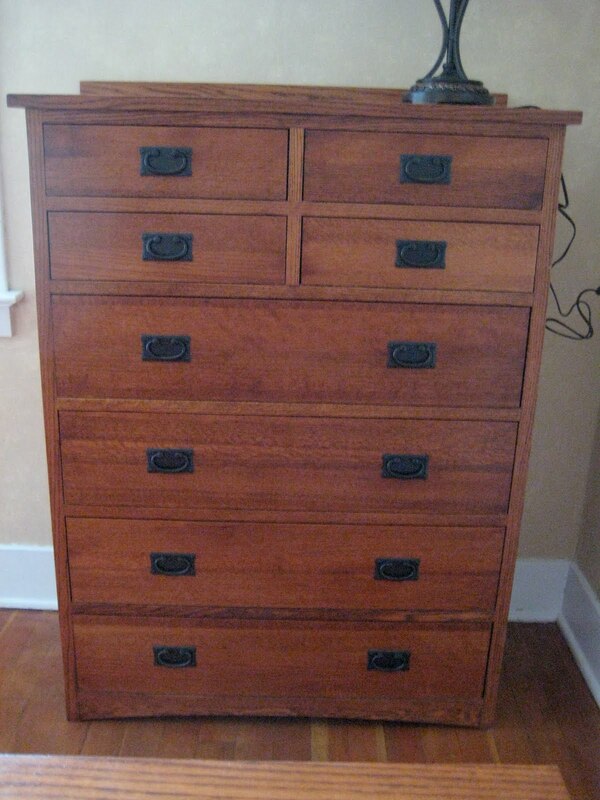 I was thinking this dresser was looking a little beat up, but now it looks quite like new. I bought a couple of cheapo end tables off of craigslist this afternoon to finish off our living room suite. These were in pretty trashed condition, but the style and price were right and they were just a few miles away. This afternoon I received my latest fabric binge order. This is my fabric for the Roman shades for the master bedroom I'm hoping to get built next week when I return to California. I'm also hoping to built a shower curtain and curtains for the master bathroom. And, if I have time, a shade for the sewing room (I probably won't have time, but I can hope).